The Handmaid’s Tale is a dystopian novel by Canadian author Margaret Atwood, originally published in 1985. It depicts the fall of the United States government which is replaced by a totalitarian regime, based on Christian principles. Margaret Atwood presents a society which limit the role of women and where women have no rights. 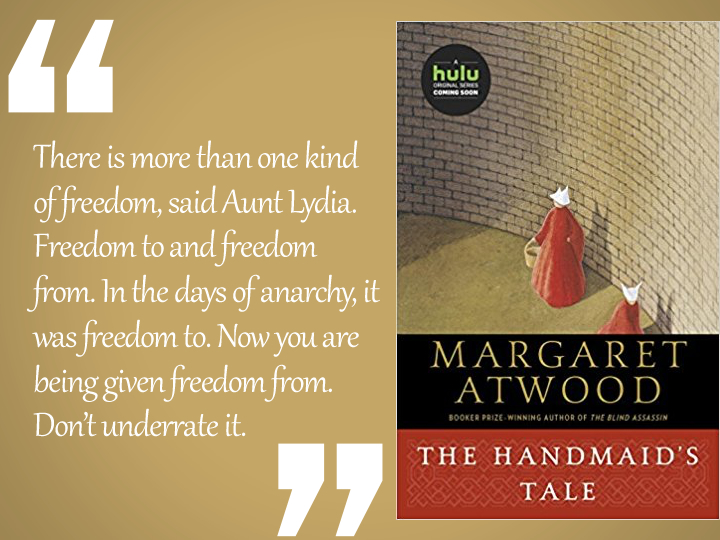 Atwood wrote The Handmaid’s Tale in West Berlin and Alabama in the mid-1980s. The novel, published in 1986, quickly became a best-seller. It is a powerful books which show us how through language ánd control of knowledge, a whole society can be controlled and manipulated. I enjoy the power; power of a dog bone, passive but there. This is the kind of touch they like: folk art, archaic, made by women, in their spare time, from things that have no further use. A return to traditional values. Waste not want not. I am not being wasted. Why do I want? The problem wasn’t only with the women, he says. The main problem was with the men. There was nothing for them anymore. There are other women with baskets, some in red, some in the dull green of the Marthas, some in the striped dresses, red and blue and green and cheap and skimp, that mark the women of the poorer men. Econowives, they’re called. These women are not divided into functions. They have to do everything; if they can.